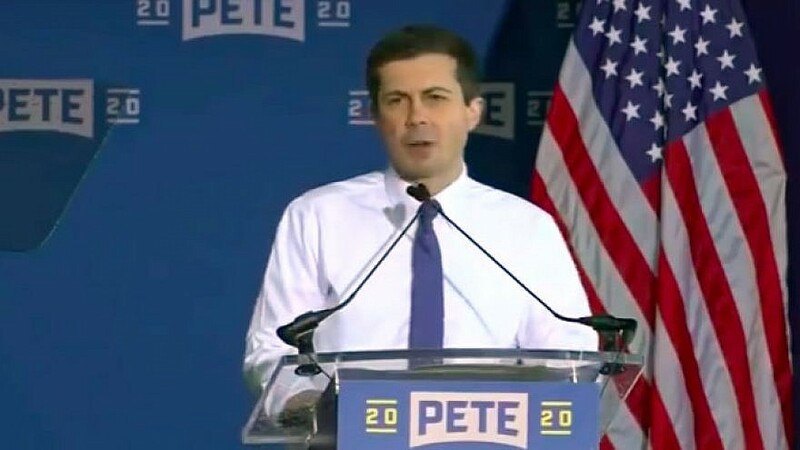 Pete Buttigieg, mayor of South Bend, Ind., announces his 2020 presidential campaign in South Bend on April 14, 2019. Credit: Screenshot. (April 15, 2019 / JNS) Pete Buttigieg, the 37-year-old mayor of South Bend, Ind., announced his candidacy on Sunday for the 2020 presidential race, joining a field of nearly 20 Democratic contenders. If elected, he would be both the youngest and first openly gay president. And he would be the first person in history to go from the mayor’s residence to the White House. As mayor of a mid-sized Midwestern city, Buttigieg’s foreign-policy record, and more specifically, his record on the U.S.-Israel relationship has not been foremost on his list of political concerns. Nonetheless, he traveled in May 2018 to Israel for the first time as part of a tour for mayors organized by Project Interchange, an affiliate of the American Jewish Committee, and met with Israeli politicians, business people and other leaders. Reflecting on the trip, he told the AJC’s podcast, “AJC Passport,” that since then his town had been in touch with the Israeli startup Zen City, which utilizes social media to assist cities. 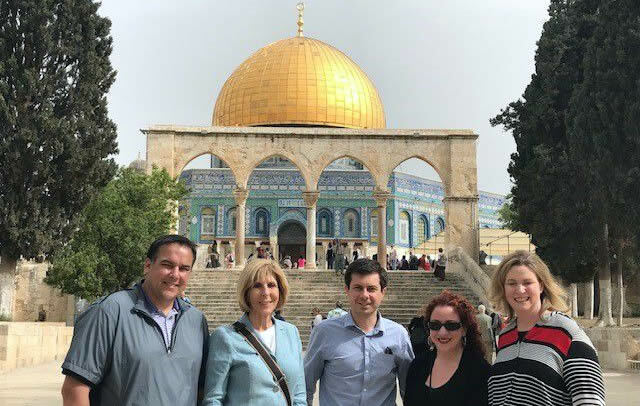 South Bend, Ind., Mayor Pete Buttigieg, Democratic presidential candidate, on Temple Mount near the Dome of Rock Mosque alongside the Mayor of Columbus, Ohio, Andy Ginther; now former Mayor of West Palm Beach, Fla., Jeri Muoio; and Mayor of Dayton, Ohio Nan Whaley on May 10, 2018. Credit: American Jewish Committee. While he was in Israel, rockets were fired at the Jewish state from Syria. On the podcast, Buttigieg addressed the waning support for Israel in the Democratic Party. “There is a risk that support for Israel could come to be regarded as a partisan issue, and I think that would be really unfortunate,” he said. On peace in the Middle East, on the AJC podcast Buttigieg questioned U.S. President Donald Trump’s commitment to such an outcome. However, Buttigieg remarked that Hamas is to blame for Gaza’s problems. However, like many within the Democratic Party, Buttigieg has also stuck by the prospect of a two-state solution for the Israeli-Palestinian conflict and has criticized Israeli Prime Minister Benjamin Netanyahu’s stances on the issue. “This provocation is harmful to Israeli, Palestinian and American interests. Supporting Israel does not have to mean agreeing with Netanyahu’s politics. I don’t. This calls for a president willing to counsel our ally against abandoning a two-state solution,” tweeted Buttigieg. In January, Buttigieg criticized Rep. Ilhan Omar (D-Minn.) for comparing Israel to Iran. Though former U.S. President Barack Obama has called him part of the future of the Democratic Party and he has skyrocketed in the polls, whether Buttigieg can maintain the momentum is a question in the making.